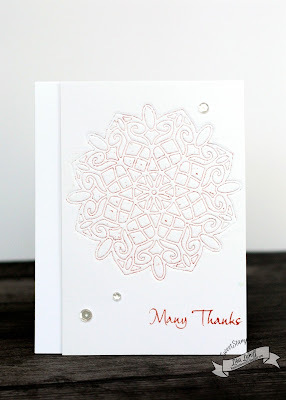 SweetStamps BLOG: Faux Letterpress with Dies! So simple and yet so elegant! The basics for this technique includes inking up an intricate die, running it through your maching with an embossing mat, and using watercolored paper. Viola! I then stamped my sentiment, and raised my panel up but chose to stick with all white as I didn't want to distract from the Medallion die image. Thanks so much for stopping by and have a fantastic weekend! What a great look- love this neat technique : ) Thank you for sharing the link too- off to check it out! Wonderful technique and the Medallion looks awesome. Love the simple design and the added bling.